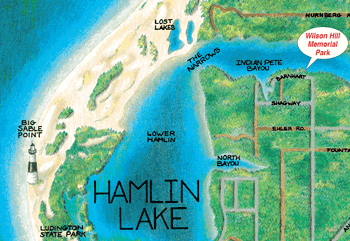 When visiting Upper Hamlin Lake, you'll find that Wilson Hill Park is quite the popular place. You can enjoy a picnic at one of the tables under a covered pavilion, with grills available for use. There's a small playground for kids and a port-a-potty. Upper Hamlin Lake is a beautiful area to visit, with many different lodging facilities, things to do such as boating & fishing, and even a restaurant conveniently located on the water! Summer or winter, fishermen like using the boat launch at Wilson Hill Park--a perfect location that allows access to Upper Hamlin Lake. In the winter months, the park is a popular spot to get on the lake when it is frozen over for ice fishing or snowmobiling. There's plenty of parking, with enough area for boat trailers. It's also a good location to stop and take a break. With picnic tables to sit, grills to make a lunch, and a port-a-potty, Wilson Hill Park is a nice family park to visit when in the Upper Hamlin Lake area. Coming into Ludington on US-10, take a right onto Jebavy Drive (the stoplight with Mancino's on the corner). Follow Jebavy north until it turns into Barnhart Road--Wilson Hill Park is to your right.